Welcome to the monthly SFR Brigade's Amazon Tag Party. Please find the list of this week's participating titles below. All you need to do is click on the title and it will take you to the relevant Amazon page. Happy Tagging! 2.Scroll down to the 'Tags Customers Associate with this Product' header. Please be aware that not all the tags show up on the books - you will; need to click 'show all (number of) tags' to see the full list. There's also a limit to how many tags you can agree with - 15 - so choose wisely my young apprentice! PLEASE NOTE! There's been some mention on Twitter by Liana Brooks and Jo-Anne Kenrick about 'malicious' tags , such as 'boycott', 'too expensive' and even 'delete'. While people are obviously entitled to their opinion, suggesting that a book should be tagged 'delete' is just plain nasty. If you happen to see any tags of this kind on a book during the tag party, please could you mention it in the comments and/or if you see a way to report it, then do so. Thank you. 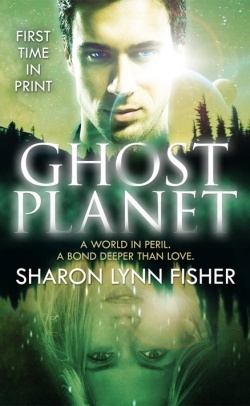 My "First Look" post about Sharon Lynn Fisher's GHOST PLANET is live at Heroes and Heartbreakers! The "First Look" feature is a way for bloggers to share an interesting tidbit about forthcoming books. GHOST PLANET sure gave me plenty to choose from, but I decided to zero in on the story's intriguing high concept premise. It kept me riveted, I tell you. Students grades 5-12 are encouraged to become a scientist for a day with this essay contest about Saturn. I grew up on comic books, devouring the adventures of Superman, Batman and Wonder Woman like candy. There were a lot of heroes I loved to follow, from Green Arrow to the Avengers to the X-Men, all of them taking place in a world something like our own but just *that* bit different. And by different I mean twisted enough to allow the existence of superheroes. When I started writing the first in the "Blaze of Glory" trilogy I wanted to show a reason why superheroes would exist and battle on an almost daily basis with the good guys always winning but never quite managing to keep the bad guys in jail. And the bad boys (and girls) always somehow escaping to fight another day while the good citizens continued to work around this nonstop destruction and fighting. It took a bit of time to figure out the reason but I got it - all the fights were fixed! By the time I got to the third book in the trilogy, "Heroes Lost and Found" releasing October 2nd, I knew there had to be some sort of final end in sight for our intrepid team of supers who had managed to break their chains and earn their freedom from their captors - a resolution and, in a way, a new life ahead of them. Which brings us to the final fight, the final battle for Jo and Hunter as they figure out who they are, where they are going and how they're going to get there. Jo Tanis is still recovering from her near-death experience in Las Vegas when she receives a mysterious postcard from Harris Limox, who claims to have a promising lead on the whereabouts of the Controller. Over her boyfriend/guardian Hunter’s objections, she sets off to a sleepy Oregon town to ferret out the truth. The Controller is more than just a disgruntled super. He’s a rogue Guardian who was presumed dead and is now armed with a slew of high-tech hardware that not only makes him physically superior to the supers—and therefore almost impossible to destroy—he’s got the ability to detonate the implants in the back of all supers’ necks. In Oregon, Jo meets a surviving Alpha super, Kit Masters, whose wild plan to capture the Controller could put an entire town of innocents at risk. But instead of successfully talking her former idol out of his disastrous bid to regain former glory, Jo finds herself betrayed and trapped in her worst nightmare. Fight her former teammates, or die. And who is, in the end, a superhero. Heroes Lost and Found: 4 out of 5 stars "Brisk and playful, Nantus achieves the perfect balance between romance and explosive action..."
Heroes Without, Monsters Within: 4 out of 5 stars "This sequel … surpasses the storytelling of the original. Nantus knows how to work with setting; the scenes in Las Vegas are vivid and accurate while the supers' secret lair is homey and comfortable." Why not grab them all and have the complete series on hand?